This isn’t the first we’ve heard about Yelp allegedly targeting small businesses – sadly, it’s not likely to be the last. The BBB currently gives them A+ status – even with 1400+ complaints! So, the claim is that you’re penalized if you don’t advertise. But – what if you DO advertise? Thank you for writing. We are glad to have this opportunity to address your concerns. You expressed concern with the results of your Yelp advertising program. You signed up for 500 ad impressions plus video hosting for the price of $315 per month, with a 12-month commitment period. During the 8 months that ads have been running for Inspiring Hands Therapeutic Massage, 1/3 of the traffic received has come as a result of clicks on the ads that you paid for. Additionally, when you were using the Call to Action feature, which provided a link for customers to click to make an appointment, 19 clicks were received. You can view a monthly breakdown of your User Views and Customer Leads on the landing page of your Business Account. All in all, the ad program is doing precisely what it was intended to do. It has increased your exposure with a relevant audience and provided you with opportunities to convert traffic into customers (the CTA feature being one of these tools). If you would like to cancel your program, please send a written cancellation notice to your account manager before the 15th of the month. If you choose to cancel before the end of your commitment period, an early termination fee of $930 will be assessed. $2,520 / 19 clicks = $132.63 per click. And then there’s the $930 “Early Termination Fee”. That sure would have bought a lot of other kinds of advertising. Darned if you do – Darned if you don’t. The good news is – Yelp isn’t the only way to get honest reviews that help your business. Need advice? Just ask. 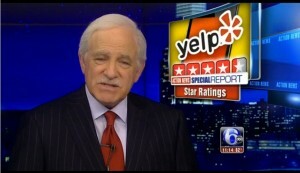 The post More Complaints About Yelp Advertising Practices appeared first on Ken Ivey.